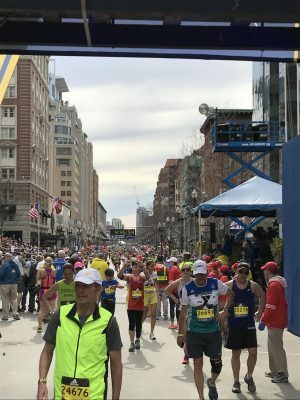 April 17, 2017 was the 121st running of the Boston Marathon, a race considered by many as the world’s most elite marathon drawing over 30,000 participants in the 26.2-mile trek from Hopkinton, MA to Boylston Street in downtown Boston. This years’ race was warmer (70-75°F) than the average year, thus resulting in a greater number of runner’s seeking medical care during or following the completion of the race. 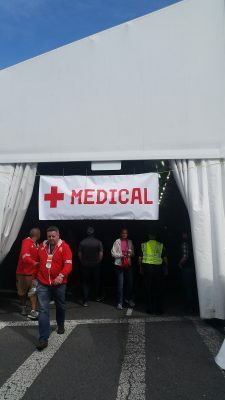 In total, ~2,400 runners were treated in medical tents both at the finish and along the course throughout the day ranging from minor issues (muscle cramps, dehydration and musculoskeletal injuries) to more severe injuries such as exertional heat stroke and hyponatremia. As a result of the heat, 20-25 runners were treated for exertional heat stroke (EHS) both on the course and at the finish line. Why so many EHS’s you might ask? Well given the time of the year (April) and provided that many runners training throughout the winter months have limited heat exposure during training, there is a greater risk of exertional heat stroke when environmental conditions become warmer than average conditions, which was evident at this year’s race. 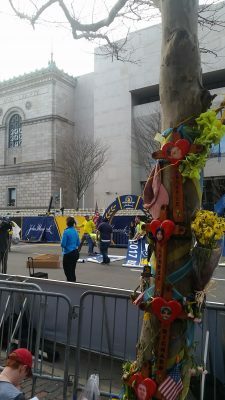 For the 2017 Boston Marathon, I was assigned to the finish line chute, which is located from behind the finish line to the medical tent in front of Boston Public Library. I was responsible for observing the finishers crossing the finish line and identifying those runners who were injured or suspected of having potential issues (e.g. exertional heat stroke). In previous years, I have worked in the medical tents located at finish line, so this year was a new experience for myself as a clinician as I transitioned from treating runners triaged to the medical tent to identifying runners in need of medical care upon finishing the race. Overall, the Boston Marathon is an amazing experience and it has been a privilege to work alongside great clinicians over the past 6 years. It is a gratifying feeling having runners stop after finishing the race and thanking you for being there and making their race experience the best it can be. Marathon Monday also has special meaning for myself personally as I met my now wife 6 years ago at the race as we both volunteered to be a part of the medical staff in 2011. For clinicians wanting to get a sense of what it is like to provide medical care at a mass participation event, I would strongly encourage anyone to sign up to volunteer for the Boston Marathon and get to experience what the world’s best marathon has to offer. My first 3 years I worked in Medical Tent A, however for the past 3 I have had the honor of working in Medical Tent B on the heat team. Good ole’ section 19! This year was like the rest in that my primary responsibility was to assist in the administration of the cold-water immersion treatment for any runners whose core body temperatures exceeded 104°F. Given the number of EHS patients is not nearly that experienced in Med Tent A, in addition to being on the heat team, my section also provided care in a similar fashion to the other sections of the tent. I had the honor of working with two fantastic nurses, two physical therapists, and a medical student in charge of documentation. Each year I meet new people and it is always a great experience. 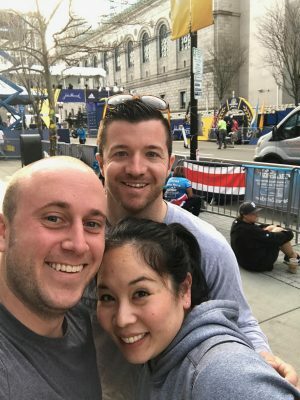 Although, the weather this year brought more dehydrated, slightly hyponatremic (low blood sodium), and muscle cramping athletes our way than years past, it was another successful day in Boston and I strongly encourage anyone who is interested in working the medical tent to volunteer and come see a side of the marathon that most don’t even know about. I promise it will be an experience that you will always remember! The 3rd annual Collaborative Solutions for Safety in Sport meeting was held last week in Kansas City, MO that brought over 100 individuals representing all 50 states and the District of Columbia together to continue the task of enhancing the health and safety policies for high school athletics. 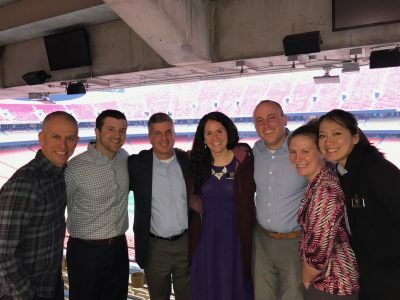 This meeting, hosted by the National Athletic Trainers’ Association and the American Medical Society for Sports Medicine and supported by the Korey Stringer Institute and Gatorade, began out of an idea spawned by Drs. Douglas Casa, PhD, ATC, FACSM, FNATA, FNAK and Jonathan Drezner, MD to make high school sports safer for the participating athletes. This years’ meeting was constructed so that the attendees decided on the topics to be discussed. Prior to the meeting, all of the attendees were sent a survey that asked them which topics they would either want to learn more about or have in depth discussions about. From the survey, 16 breakout sessions were formed where the attendees who wanted to learn more about one particular topic were able to come together in small groups to have further discussions. Overall, these breakout sessions were immensely successful as they stimulated many fruitful discussions over the successes, barriers, and other strategies to help develop and implement health and safety policies across the US. It was great to see states that have been successful in implementing change in a certain area (i.e. heat acclimatization) providing feedback and suggestions to states that have not been successful in implementing such policies. These discussions provided great peer-to-peer feedback, which may have been better received for some individuals. 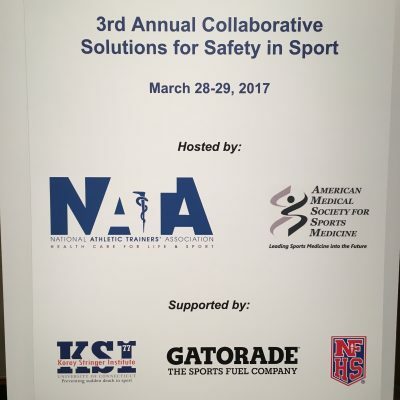 Having attended all of Collaborative Solutions for Safety in Sport meetings over the past three years, it has been amazing to see the efforts taken by leaders within state high school athletics associations and sports medicine advisory committees following the meeting to develop and implement health and safety policies. States like Vermont, Illinois, South Carolina, Utah, New Jersey and many others have taken advantage of these meetings to implement best-practice policies in their state with many crediting the Collaborative Solutions meeting as the event that was the impetus for change. While many states have made great strides in improving the health and safety of their student athletes, others have remained resistant to change and often citing “We haven’t had anything happen in our state, so there is no reason to change.” We must remember that implementing evidence-based minimum best practice policies such as emergency action plans, heat acclimatization, access to AEDs, environmental-based activity modification guidelines and the management of sport related concussion, cost little to no money to implement and there should be no reason not to take the proactive steps to keeping our young student athletes safe. Keeping the forward progress mindset and further cultivating relationships between sports medicine advisory committees, high school athletics associations and coaches with the mindset of having the most up-to-date evidence-based policies in place is needed to ensure that our young athletes are protected while playing the sports that they love.